The two modes can be switched using the template's AutoGenerateColumns property. The default value of the property is true, indicating the columns will be generated from the data source. If additional control is required at compile time over the columns to be shown in the grid, columns can be added manually. 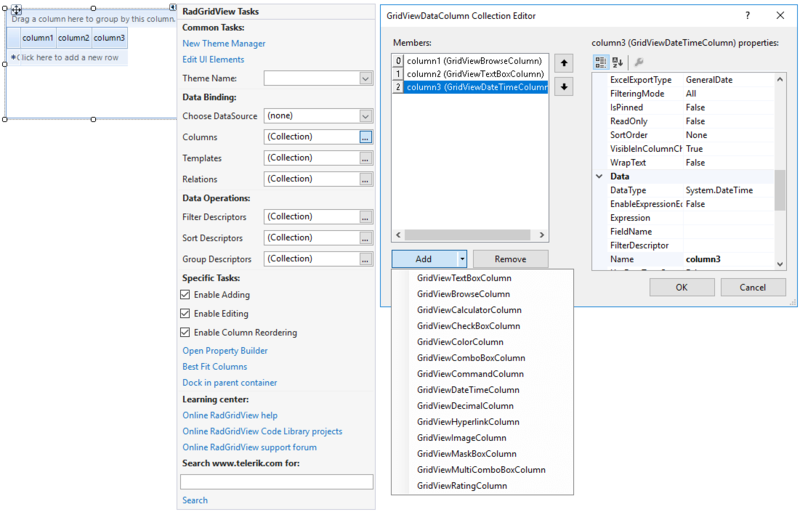 Auto-generation of columns means that when you set the DataSource property of the RadGridView control to a collection of employees for example, a separate column will be created for each one of the public properties of your Employee object. This is the default behavior and it does not require any additional efforts from your side. Just set the DataSource of your RadGridView and you are ready. Ensure that your property is browsable in order to show the respective bound data. The Browsable attribute set to false will make the property on which it is used not bindable. This will prevent other controls which use the CurrencyManager for extracting properties to bind to such a class. Select RadGridView and click the small arrow at the top right position in order to open the Smart Tag. 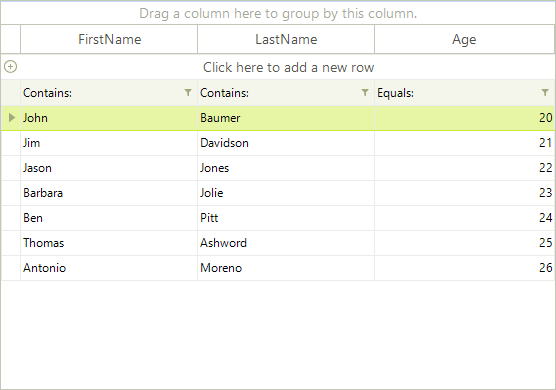 Click the Columns' browse button which opens a dialog that displays GridViewDataColumn Collection Editor. This editor lets you add different kind of columns to your table.